BALTIMORE – A famed player from this year’s Baltimore Ravens football team recently turned down an invitation to the White House, citing his disappointment with Barack Obama’s pro-abortion policies. 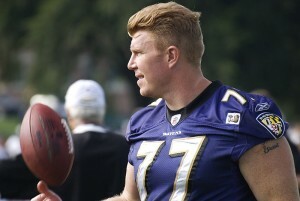 Matt Birk, a 6’4”, 310-pound center for the Ravens, has played professional football for the past 15 years, and has participated in six Pro Bowl competitions. Since the Baltimore Ravens were Super Bowl champions earlier this year, Birk and all his teammates were invited to the White House for an exclusive meeting with the President on Wednesday. However, Birk boldly declined the once-in-a-lifetime opportunity, saying he strongly disagrees with Obama’s stance on abortion, especially when it comes to the administration’s support of Planned Parenthood—the largest abortion provider in the country. This was not the first time Birk—a Catholic and a married father of six—has made attention-generating statements, however. In October of last year, he wrote an opinion piece for Minnesota’s Star Tribune, in which he firmly voiced his support for Biblical marriage, saying marriage redefinition is harmful to children. Also in October 2012, Birk created a brief video for the Minnesota Catholic Conference, in which he detailed why Biblical marriage is worth supporting and defending. Like his outspoken statements on the marriage debate, Birk’s decision to boycott the White House trip have generated plenty of feedback. In particular, dozens of commenters have joined the debate on the website of Minneapolis/St. Paul’s KFAN, which is the sports radio station that first aired Birk’s comments on the abortion issue. However, another applauded Birk’s courage. “God bless Matt for standing up and making a statement despite its unpopularity with secular society,” they wrote.